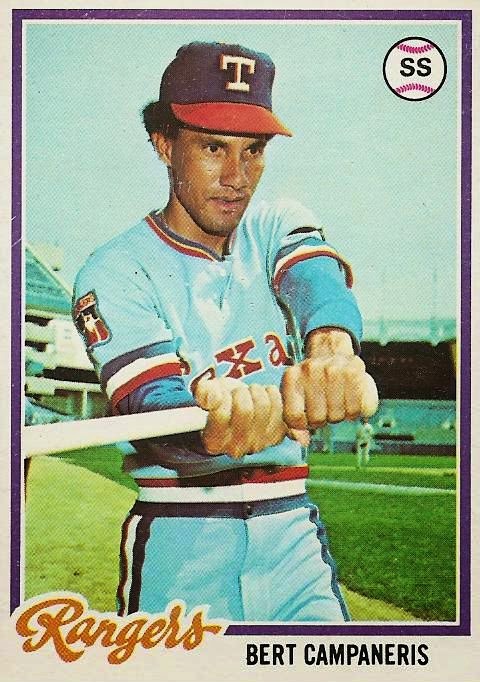 Texas Rangers Cards: 1978 Topps - Bert Campaneris. 1978 Topps - Bert Campaneris. Bert Campaneris, shown here on card 260 of the 1978 Topps set, was entering his second year with the Rangers in 1978. His 1977 season had been a bit a of a let down as far as his speed on the basepaths but was otherwise exactly what the Rangers hoped for when they brought him over from Oakland. Campy was hoping to improve in his second campaign as the Rangers starting shortstop. The season wouldn't turn out the way Bert or the Rangers hoped. Campaneris ended up playing 728.2 innings at shortstop in the course of the season. He committed 20 errors over the course of the season for a .954 fielding percentage. That was a significant drop from 1977 and ten points below the league average. More distressingly, Campy's range decreased noticeably. Things weren't any better at the plate. In 319 trips to the plate Bert managed to hit just .186 and post an on-base percentage of only .245. Both were drastic drops from 1977 and the lowest among the starting lineup. Bert Campaneris was in trouble. The Rangers signed him to be their starting shortstop but he was now facing the very real prospect of losing the spot to Nelson Norman or Jim Mason. Both had already poached playing time from him as the season progressed and Bert's bat didn't come around. Going into Spring Training in 1979 he needed to make some drastic improvement or he was going to lose his starting gig for the first time in his career. Senators Saturday - Ken McMullen, 1967. Senators Saturday - Barry Moore, 1967. Senators Saturday - Ken Hamlin, 1966. 1978 Topps - Tommy Boggs. Senators Saturday - Mike McCormick, 1966. 1978 Topps - Bert Blyleven.